WASHINGTON — The weather outside is frightful. Due to a major storm that moved through the area, all Maryland schools in the D.C. metro area — as well as most major systems in the region — are closed. Federal agencies in the region are operating under a two-hour delayed arrival with options for telework or unscheduled leave. The District saw nearly an inch fall while areas in extreme Southern Maryland are reporting more than five inches. The entire D.C. area remains under a Winter Weather Advisory until 1 p.m. Frigid conditions are expected to continue throughout the day. St. Mary’s and Calvert counties in Maryland are under a Winter Storm Warning until 1 p.m.
Road conditions in the District vary. Major arteries are mostly just wet but secondary roads are slushy, reports WTOP’s Dave Dildine. And neighborhood roads with light to no traffic are covered. Outside D.C., in Anne Arundel County, Maryland, along Route 50, it’s a different story. Major roads there are pasted in windblown snow and many back roads are covered. 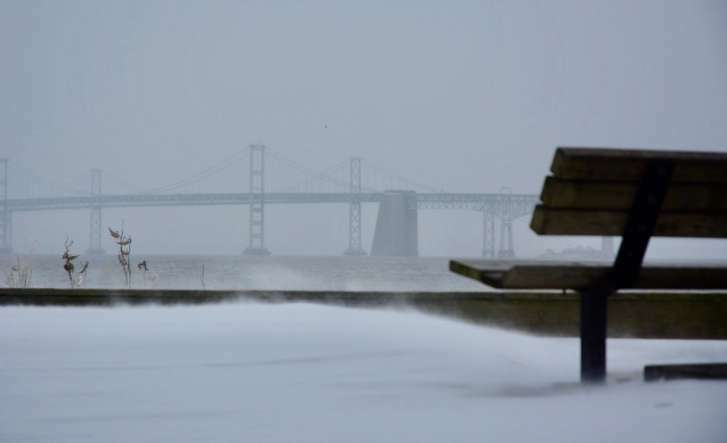 On the Bay Bridge, winds are gusting to near 50 mph, prompting wind restrictions. In Virginia, WTOP’s Kathy Stewart reports that the bitter cold could be freezing the snow that melted earlier on the roads and the blustery winds are blowing snow on the ground all around, making it difficult to see at times. “The signed roads are still packed with snow, so stopping is an issue,” Stewart said. AAA Mid-Atlantic urges drivers not to tailgate on slippery roads. Drivers should also give themselves five to six seconds of stopping distance. Thursday morning, Virginia governor Terry McAuliffe, who declared a state of emergency on Wednesday, asked for the public’s help. “I’m begging everybody — stay off the roads. We’ve got all the equipment out there, it makes it very difficult if all these cars are on the road,” McAuliffe said. “Let us do our job. On Richmond radio station WRVA McAuliffe said approximately 45,000 people were without electricity, mainly in the Virginia Beach area. McAuliffe said voters can overlook other shortcomings, but mishandling storms can be a career-killer. “A lot of politicians have seen their careers ruined while they were at Super Bowls,” he joked. The storm hit peak intensity around 4:30 a.m., according to Storm Team 4 meteorologist Matt Ritter. North central Maryland through D.C. and central Virginia have picked up a coating to an inch or two. The heaviest accumulations were in Southern Maryland and the Eastern Shore. Wind speeds will pick up by noon and, as temperatures drop, so will wind chills. Snow had largely moved out of the D.C. metro area before 9 a.m.
A number of major school systems, including Fairfax, Loudoun, Prince George’s and Montgomery counties, are closed because of the snow. Others have changed their statuses from opening late to closed. Others are opening two hours late. Find the latest from the schools on WTOP’s Closings and Delays page. Temperatures are expected to be in the mid- to upper 20s with wind chills in the teens Thursday. Be prepared when the cold gets even more bitter on Friday and Saturday with strong winds. 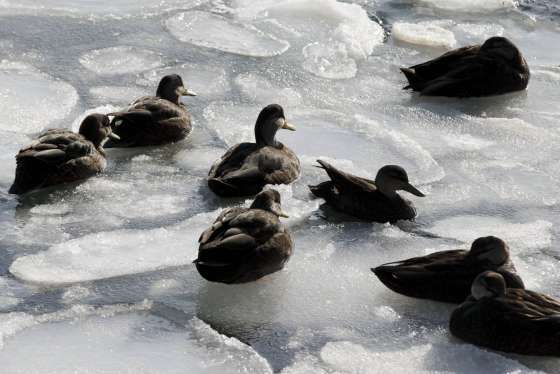 The arctic air mass is expected to retreat Sunday. Thursday: Late-day sun but windy and cold with gusts near 30 mph. Temperatures are in the mid- to upper 20s with wind chills in the teens. Friday: Sunny, windy and dangerously cold. Temperatures in teens. Saturday: Sunny, blustery and dangerously cold. Temperatures in the teens. Sunday: Sunny with lighter winds; not as cold. Temperatures in the low to mid-20s. Get the latest weather conditions from WTOP’s Weather Center. The brutal storm continues to make its way up the East Coast, already bringing a rare coating of snow and ice to parts of Florida, Georgia and South Carolina. 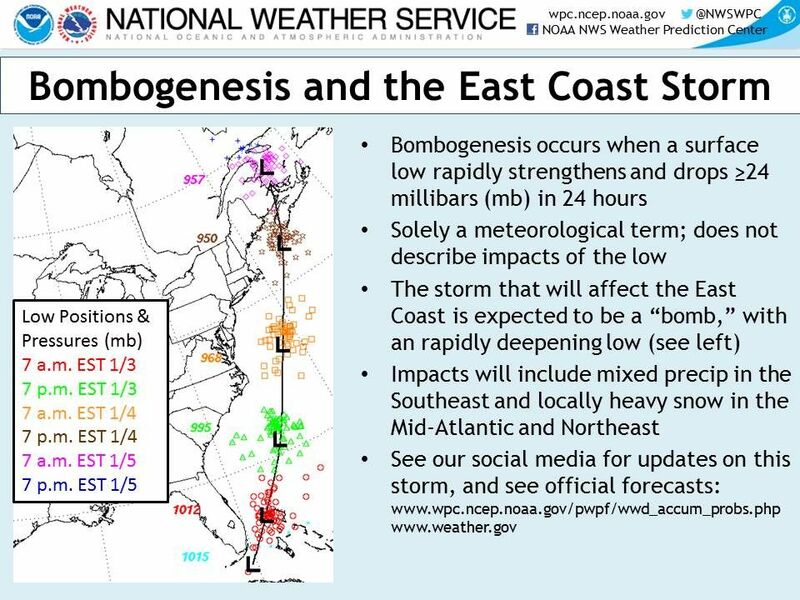 As it barrels toward the Northeast, forecasters expect the storm to likely strengthen into a “bomb cyclone,” or bombogenesis. That happens when the pressure of a storm drops 24 millibars in 24 hours — a sign that the storm is getting much more powerful in a hurry. Read more about the term and what it means. Shortly before 9 a.m., Maryland State Police implemented their snow emergency plan in Charles County to assist the state in clearing area highways. They say all vehicles on roadways must be equipped with snow tires or chains. And parking is prohibited on all snow emergency routes. Virginia State Police have remained busy during the overnight hours and into the morning. In an email, they said there have been numerous crashes but thankfully no fatalities. They ask that Virginians delay their travels until later but if residents must travel, they urge drivers to clear all snow and ice from their vehicles, allow for extra time to get to their destination, drive slow, buckle up and move over for all stopped emergency vehicles, highway vehicles and tow trucks. Around the D.C. area, the glacial conditions have also caused several water main breaks in the past few days. Amtrak services have also been affected by the weather: The Northeast Regional service between D.C. and Newport News/Norfolk, Virginia, is canceled Thursday. VRE says trains will operate under full service. The Virginia Department of Transportation pre-treated the roads and mobilized where necessary. In Baltimore, the U.S. Coast Guard closed the Port of Baltimore head of the storm. The Maryland Department of Transportation says the Coast Guard won’t allow ships into the port from 6 p.m. Wednesday through Friday morning. Truckers who were scheduled to pick up shipments are urged to make other plans. The worst conditions stretch from the Carolinas to Maine, with the Northeast getting the brunt on Thursday. It already has led to thousands of canceled flights and shuttered schools, as well as fears of outages and flooding. Officials are urging residents to stay home so crews can clear streets and roads of what could be as much as foot or more of snow in some places. Boston could get as much as 14 inches. The blast of winter weather and accompanying plunging temperatures has been linked to at least 17 deaths as far south as Texas. Visit the National Weather Service’s website for the latest regional snowfall totals. WTOP’s Neal Augenstein, Teta Alim, Abigail Constantino and The Associated Press contributed to this report.